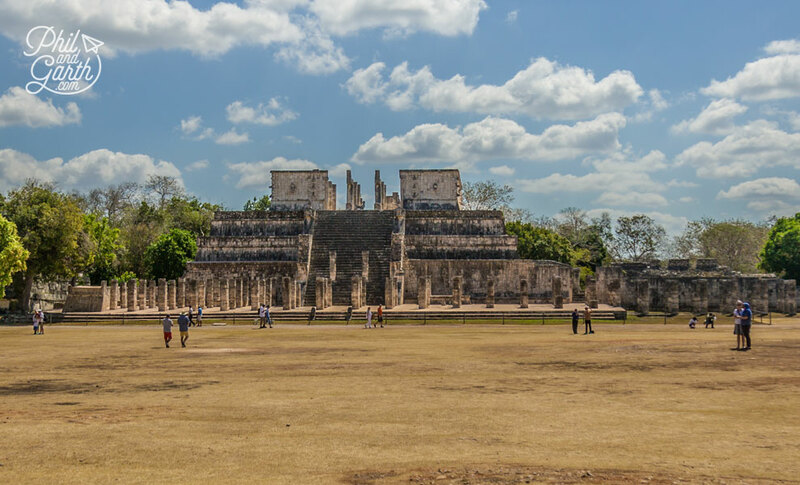 Whilst staying near Tulum we took a guided tour to the ancient Mayan city of Chichen Itza, set deep in the rainforest of the Yucatan peninsular. It’s 95 miles from Tulum and took us 2 hours by bus, if you’re going from Cancun it’s 122 miles. We were very excited as it was our chance to see our first ancient pyramid and we’ve never been to Egypt. Chichen Itza is over 1,500 years old and unsurprisingly a UNESCO World heritage site it was also voted one of the 7 Wonders of the New World. 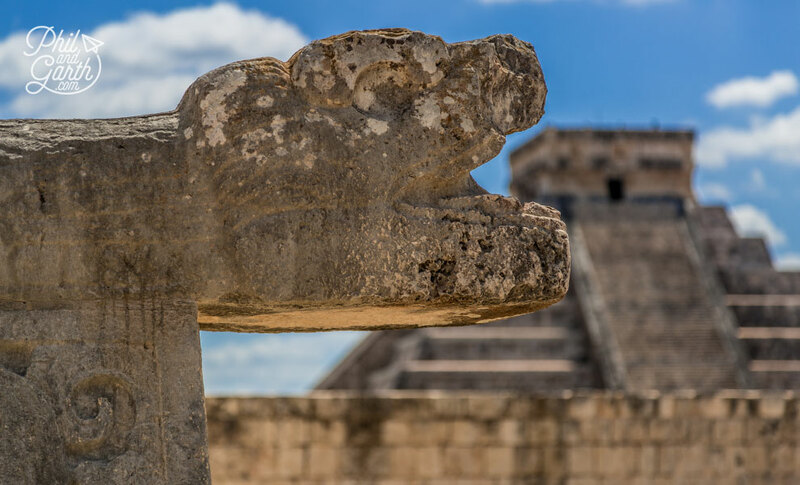 Rich in stone architecture Chichen Itza comprises pyramids, temples, palaces, a ball court and cenotes (natural sinkholes) It’s arguably Mexico’s best known Mayan site and easily the best restored site of Mexico’s Mayan ruins where feathered serpents and skulls are a running theme. There was never a Mayan Empire instead the Mayan civilisation was interconnected by a large number of cites like Chichen Itza with individual rulers and their own governments built across Mexico, Guatemala, Belize and Honduras, then called Mesoamerica. 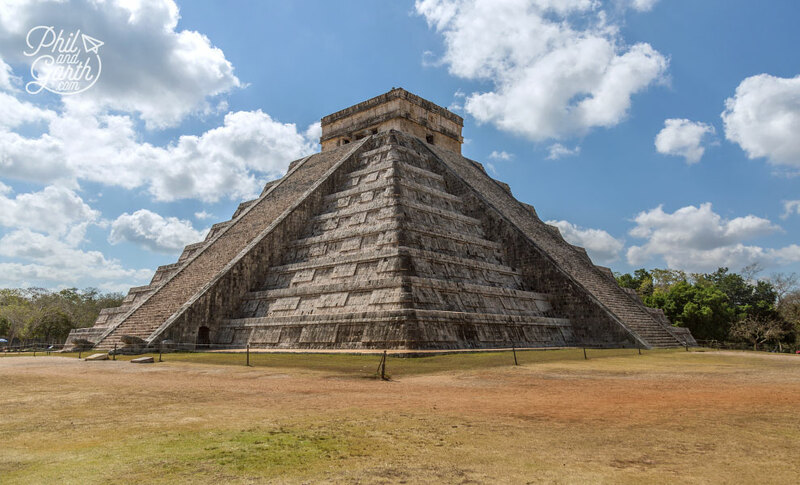 The main attraction of Chichen Itza is the magnificent El Castillo also known as The Pyramid of Kukulkán, it was a religious temple dedicated to the Mayan feathered serpent god – Kukulkán. As we entered the site, we were both excited to witness another of the world’s architectural wonders close up. 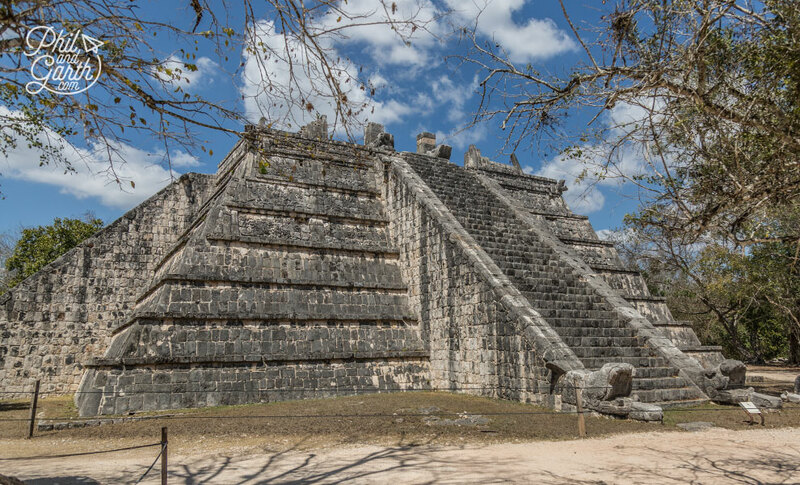 El Castillo dominates Chichen Itza standing at 24 metres tall with another 9 metres on top for the temple, El Castillo is a perfectly hand made pyramid with 9 levels and 4 faces, this gigantic pyramid symbolised nine heavens and the four points of a compass. 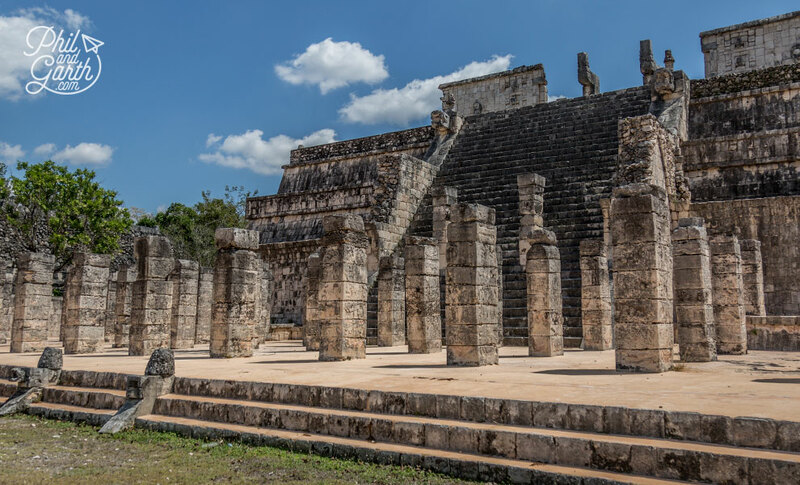 Each side has 91 stone steps, together with the temple platform makes 365 – a significant number which matches the number of days in the year, no coincidence as the Mayans were advanced in mathematics, astrology and architecture. 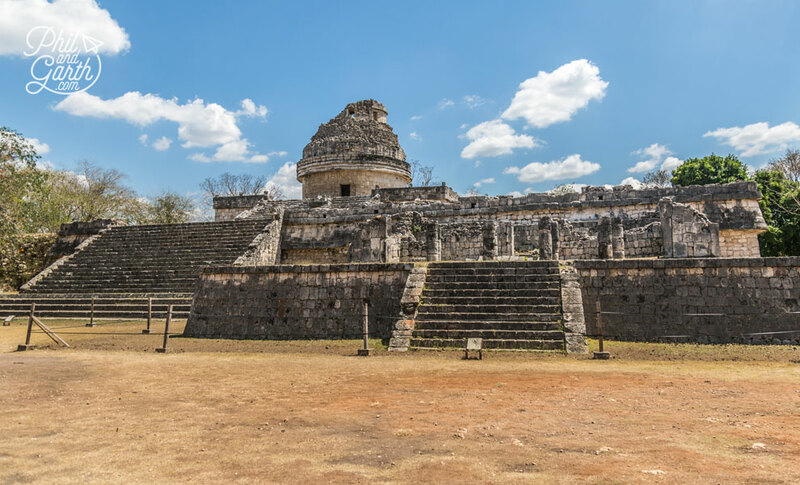 El Castillo’s main purpose was for religious ceremonies and human sacrifices at the Temple of Kukulkán at the top, which if you look closely is not symmetrical it’s actually positioned slightly off centre as the Mayans believed only the gods were perfect. 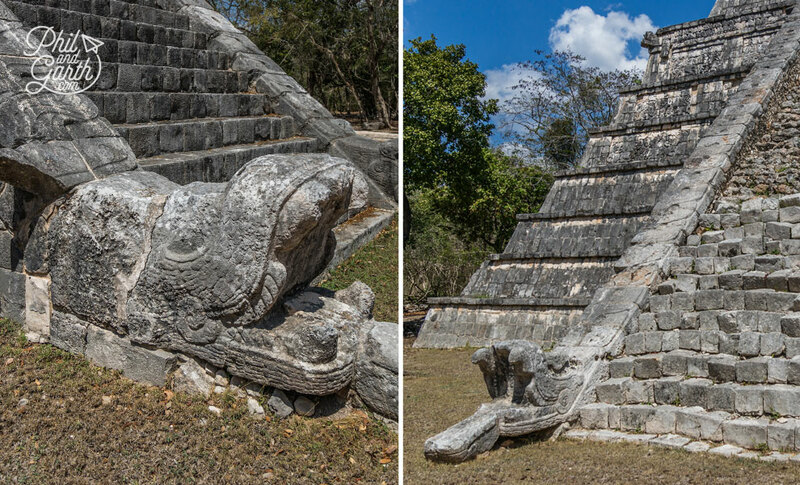 The North face has two serpent heads of Kukulkán at the bottom of the steps, they look towards where the Mayans believed the gods lived in the sky, while South is where the underworld gods lived. 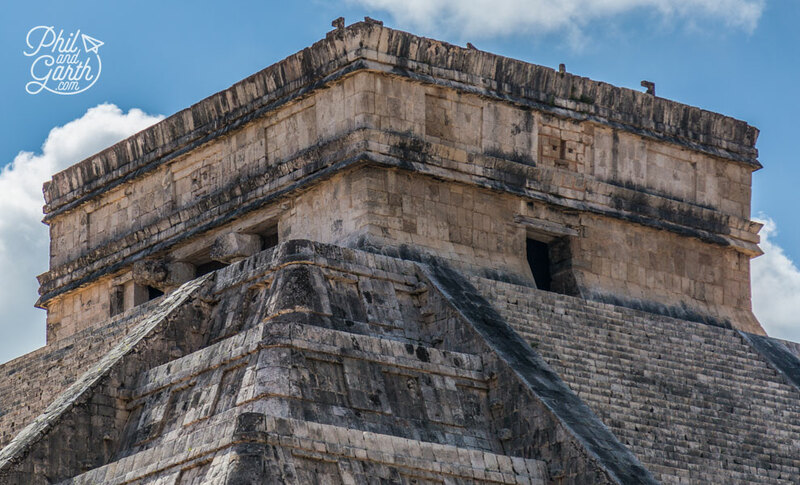 El Castillo was an impressive sight soaring into the sky, you can imagine how the Mayan population would have been in awe of this towering pyramid. we loved it’s simplicity and thought it looked best viewed from a distance. Visitors are not allowed to climb El Castillo or visit the temple chamber anymore after a tourist fell and died in 2006. In the 1930s archeologists found another smaller pyramid within El Castillo containing a chamber with a throne in the shape of jaguar, painted in red, and spots made of jade, we wondered what it was used for? Another secret is revealed twice a year on the Spring and Autumn equinoxes, when late afternoon a long shadow is cast from the corner which resembles a snake slithering down the pyramid to the serpents head at the base. Wow! 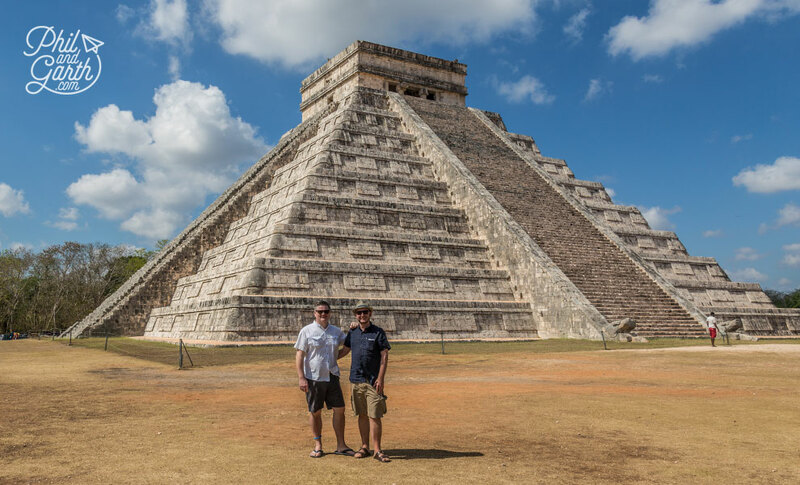 what an incredible illusion and a feat of precision engineering, testament to the Mayans astronomy skill, even Phil being an engineer was impressed! The other secret is the acoustics and sound design. Stand halfway between the North face and The Platform of Venus and clap your hands, amazingly the sound reflected back sounds just like a chirping bird, it’s supposed to replicate the Mexican Quetzal bird. 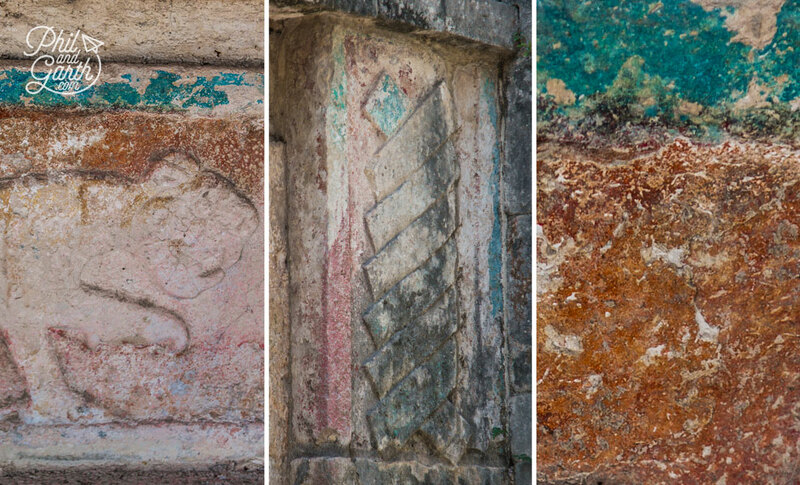 Look closely around Chichen Itza as Garth did and you will find some of the original paint on the walls – clues to the past that walls were covered in plaster and painted red and turquoise. 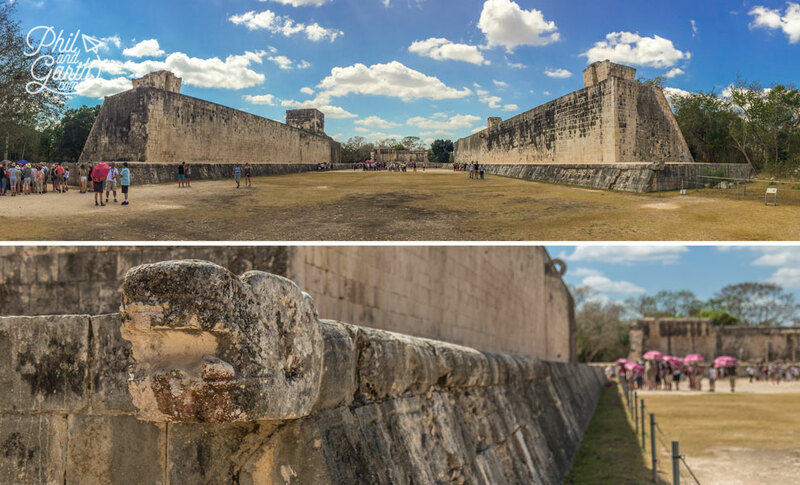 The other main sight of Chichen Itza is the ancient Great Ballcourt with its imposing parallel 9 metre high walls. Players had to hit a hard rubber ball through 2 stone goal rings set high up on each wall. The ball game was called Pitz and was played across the region where each Mayan site had its own ball court. 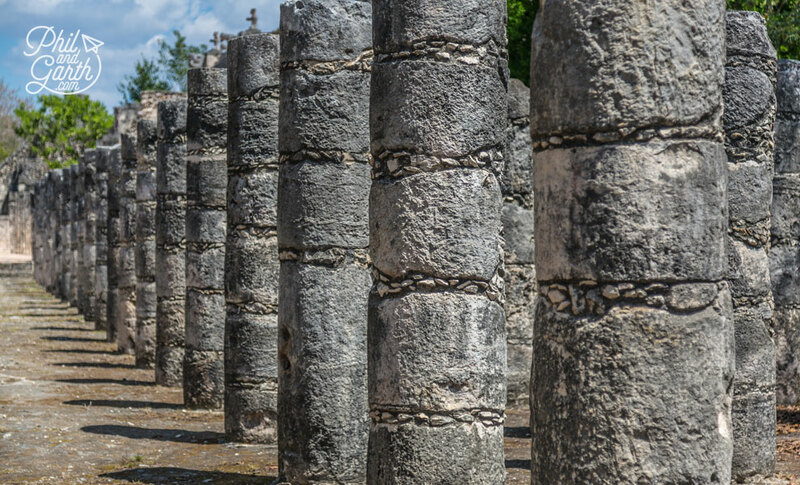 Chichen Itza’s is the biggest court discovered in the whole of ancient Mesoamerica. Players were only allowed to use their elbow, knee or hip and the ball was not allowed to hit the ground. The high priests would have sat and watched from the throne chambers at either end. But it was a deadly game where the losing team’s captain was beheaded! or was it the whole team? historians are not 100% sure, high stakes or what?! 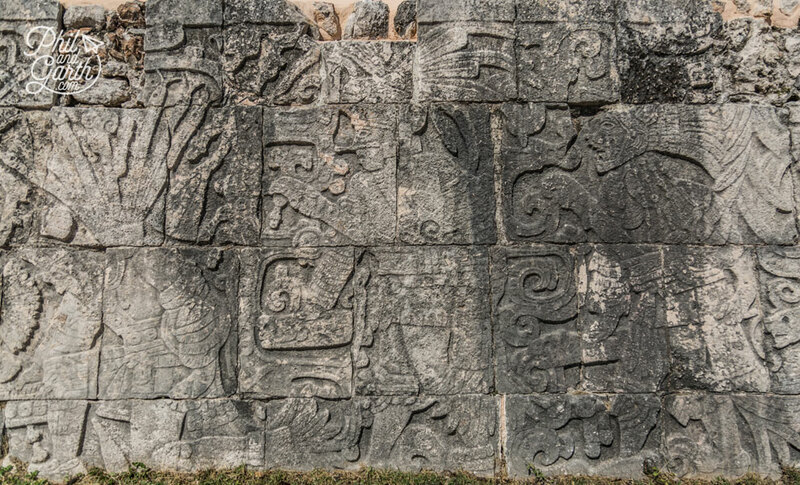 On each side are angled benches that run the length of the court, they are richly decorated with carvings – Mayan hieroglyphics depicting various scenes of the games. We wondered if the ball court is where J.K. Rowling got her inspiration for Quidditch? Tzompantli also known as the Wall of Skulls is a large platform where the sides have bas relief carvings of skulls pierced by stakes. It’s believed people were sacrificed here and their heads put on display on horizontal racks. Our guide told us distinguished people were also sacrificed so the population didn’t rebel. The Temple of Warriors is another stepped pyramid temple, with rows and rows of columns to the side which may have housed a roof. Historians are not 100% sure if its purpose but think it was used probably used as a meeting hall. Some of the square columns have carvings of warriors, sadly you can’t get up close to see them. 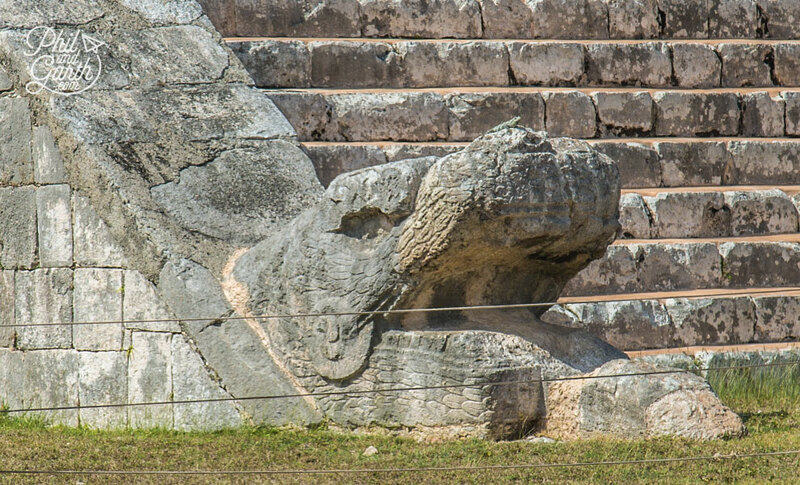 At the top of the temple is a reclining statue called Chac Mool. The statue has a flat stomach where sacrificial human body parts would have been placed for the gods in the sky. 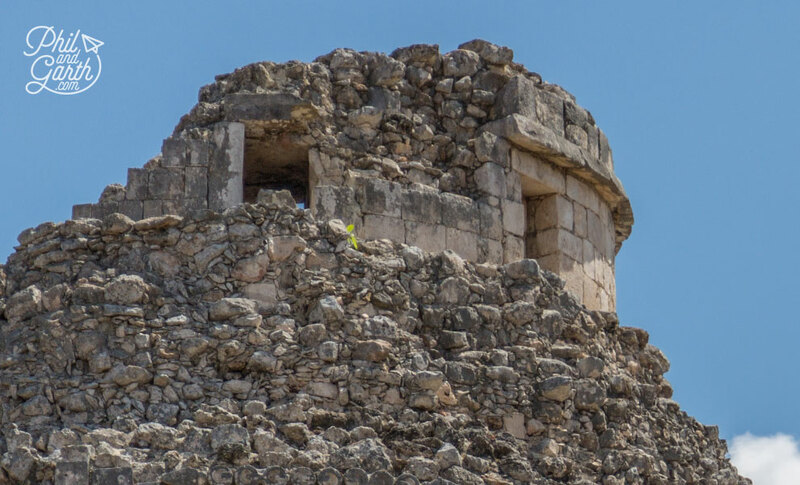 There’s plenty of other ruins in Chichen Itza to explore, walk towards the Observatory and you will come across the El Osario Temple or Tomb of the High Priest. Basically a smaller version of El Castillo, standing 10 metres tall. This was a burial tomb where archaeologists found 7 tombs, there’s also plenty more carvings of the feathered serpent. 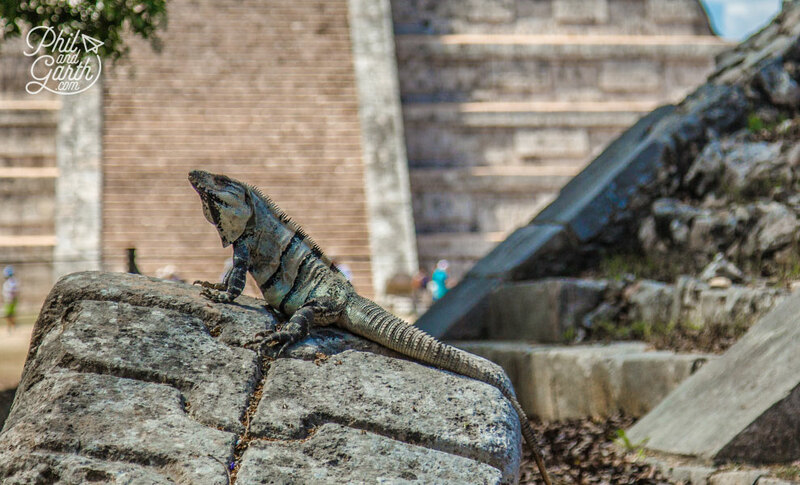 Another walk will bring you to the crumbling ruin of El Caracol. This was an observatory where the the Mayans would take in a 360 degree view of the stars. The upper 3 windows were specifically designed to track Venus appearing and disappearing in the night sky. Their astronomical skills we so good, they could even predict solar eclipses. We thought it was interesting how the circular design looks pretty similar to a modern observatory. The Mayans are famous for developing a 365 day calendar by closely watching and mapping the stars. It was actually 3 calendars that worked together to keep track of time, the moon and the sun. Only the rulers had full knowledge of the calendar as it was considered a great source of power. When you think of it’s age, it’s amazing that our calendar is based on theirs. 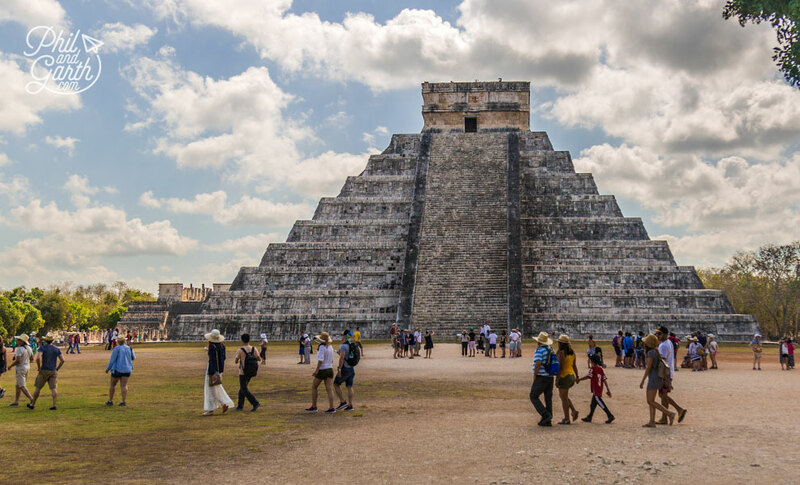 It’s not really known how Chichen Itza came to and end, its downfall was most likely down to drought, which reminded us of our visit to Angkor Wat in Cambodia which was abandoned for this reason. Las Monjas – was the government ’s palace. 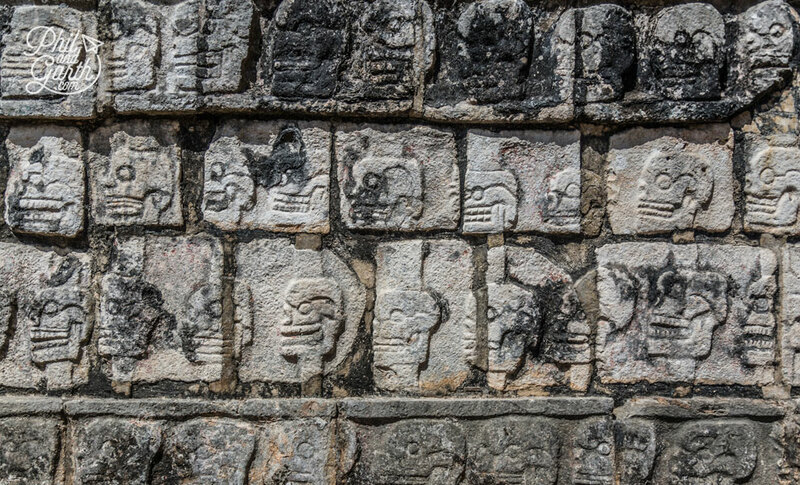 It’s richly decorated with geometric patterns and images of the rain god, Chaac. 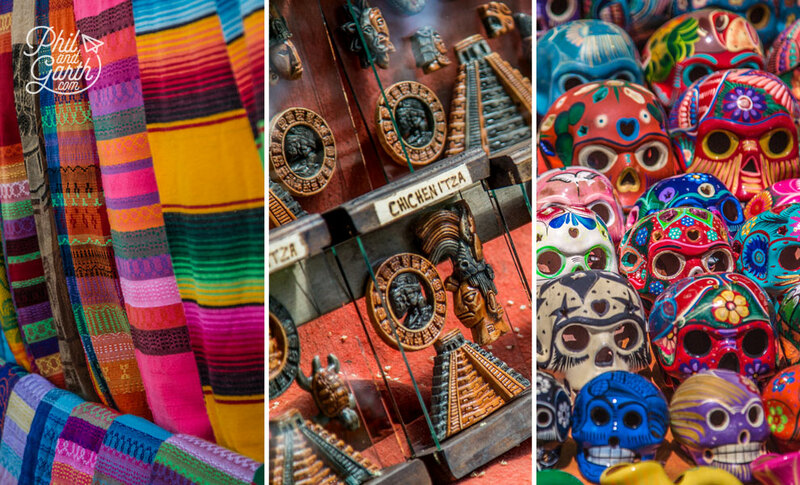 What surprised us was the amount of souvenir stalls which line the pathways between the various ruins – handicrafts, textiles, skulls, t-shirts you name it! 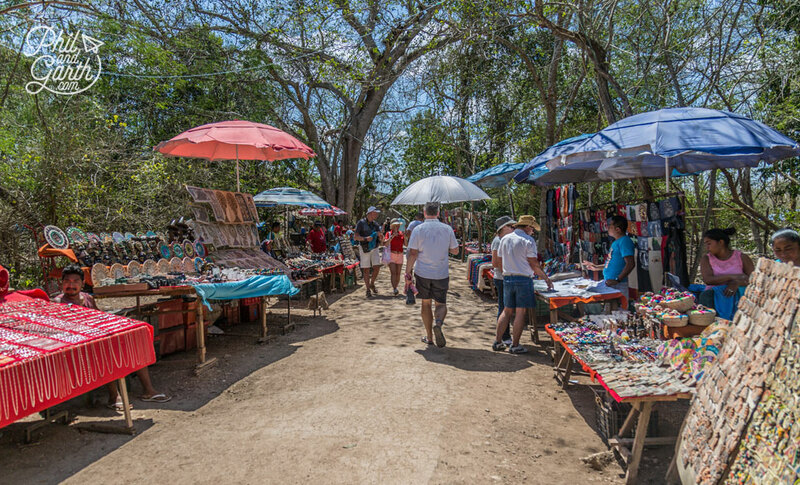 But we’ll warn you now – some of the vendors take great delight scaring the tourists with a small pottery item which when blown into makes the sound of a pack of wolves, Phil got the fright of his life walking past one stall! haha! Our guide told us even thought they have no licence to sell at Chichen Itza, the government ignores them, so you’ve been warned get ready for those hawkers all eager to catch your attention, a simple ‘no gracias’ does the trick. And if you were wondering what happened to all the trees at Chichen Itza? apparently it was wood termites – contained within wooden souvenirs brought in from China, you’ll noticed many trees in the area have their trunks painted white to show they have been treated. Chichen Itza’s popularity means you need to get here early in the morning, as soon as it opens if you can to avoid the hoards of crowds who arrive from 12 noon and into the afternoon. If like us you’ll probably take a day trip from your hotel, it’s worth paying a bit more for the tour operator that leaves the earliest. 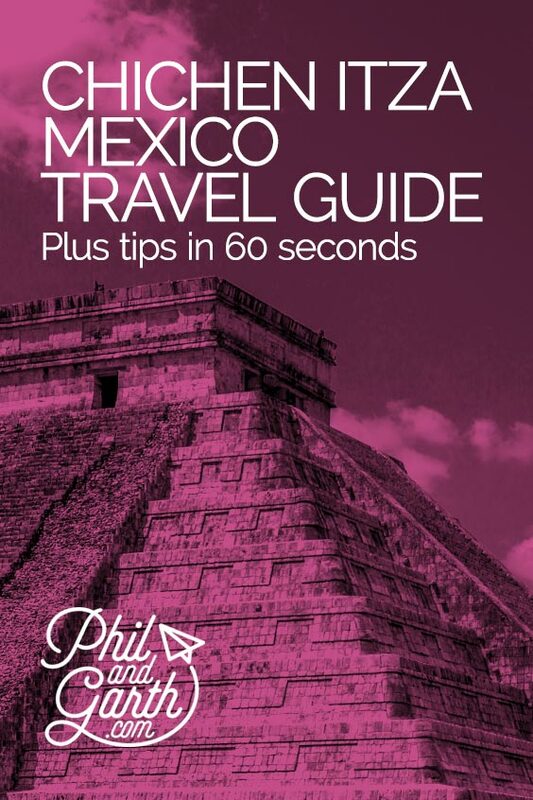 The good thing is you actually go back in time, by an hour as the government set a different time zone for tourism in Cancun and the Riviera Maya to the rest of Mexico, so there’s more daylight time to top up your tan! You can of course stay nearby to appreciate Chichen Itza fully, there’s some retro looking motels nearby which look like they are straight from the 1950s. Then you can then take advantage of the nightly sound and light show on the site at 8pm or 7pm in the winter. When you are looking for a day tour, look for ones that stop off at a cenote, which are natural sinkholes, there are lots of cenotes all over the Yucatan peninsula. After visiting Chichen Itza we stopped off at the Hubiku Ceynote where you can go swimming, and yes the water is cold! Seeing it was unlike anything we’ve ever seen, like a magical underground world! Tip #1: Average temperature is 35ºC so take bottled water and an umbrella is a must, as there’s very little shade. Tip #2: Hoards of tourists arrive around 12 noon, so get here early as soon as it opens to avoid them and the fierce daytime sun. 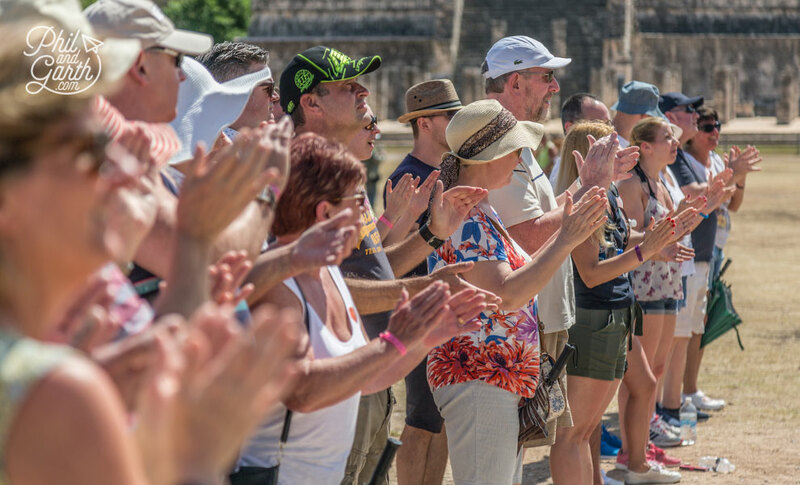 Tip #3: Considering hiring a guide who will bring Chichen Itza to life, our guide Sergio was excellent. 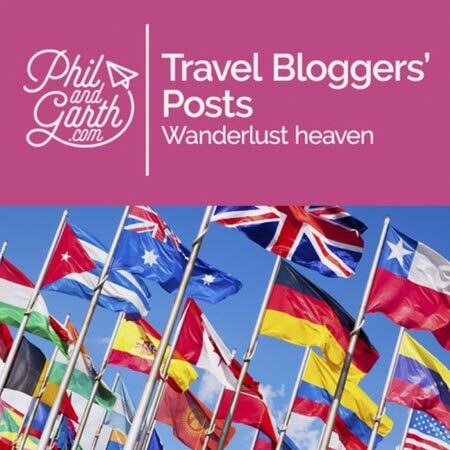 Tip #4: You’re not allowed camera tripods – so don’t bother taking one. Tip #5: You don’t get a map with your ticket, and there’s only a couple on site, so photograph the map at the Ballcourt to refer to. 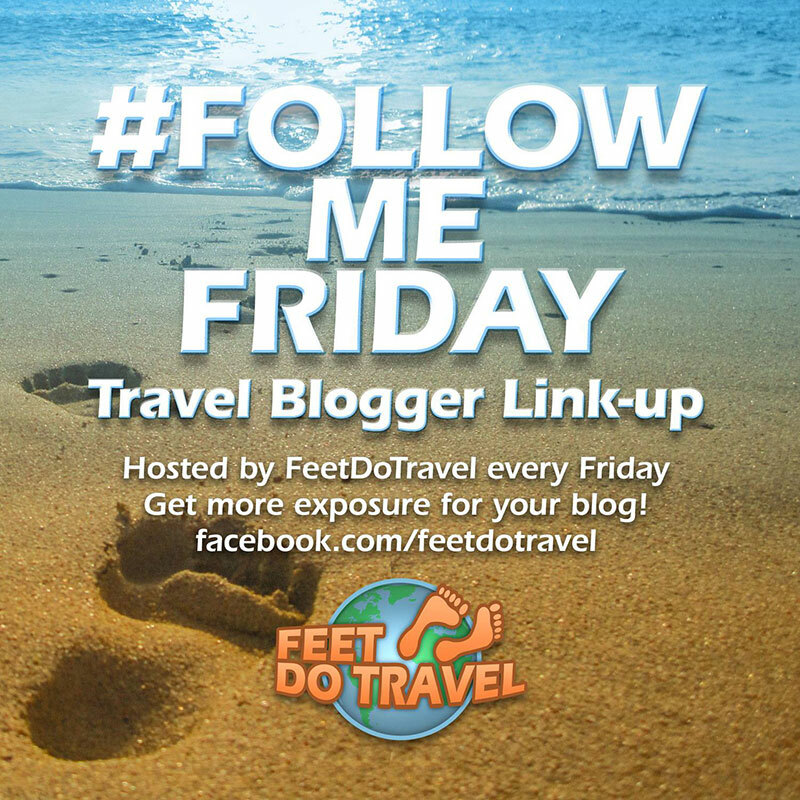 We paid for an all-inclusive beach holiday with Thomson staying at the Sensimar Seaside Suites. From here we took a day trip with Chichen Itza Sightseeing with superb host and guide Sergio, who was very entertaining and knowledgeable. The tour also included a stop at the Hubiku Cenote plus a chance to see the historic city of Valladolid. Costs were approx £100 per person. I keep replaying the video again and again! Awesome post! For history buffs like us, this seems like such a dream! Definitely will visit Chichen Itza some day. Your photography is so amazing! Love all your posts. Hubiku Ceynote also looks like something we would enjoy. Thanks for the tips. I first visited Chichen Itza about 20 years ago and you could ascend the pyramid back then, in fact Pavarotti had just made a concert from on top of the pyramid. I do have my picture at the top of the pyramid but unfortunately the camera technology was not so good back then so it’s not a clear image. The images you guys have taken are magical and so detailed. I didn’t know about the sinkhole, does it look as good in real life as your image? I teach ancient civilizations, so I would love to see this in person. 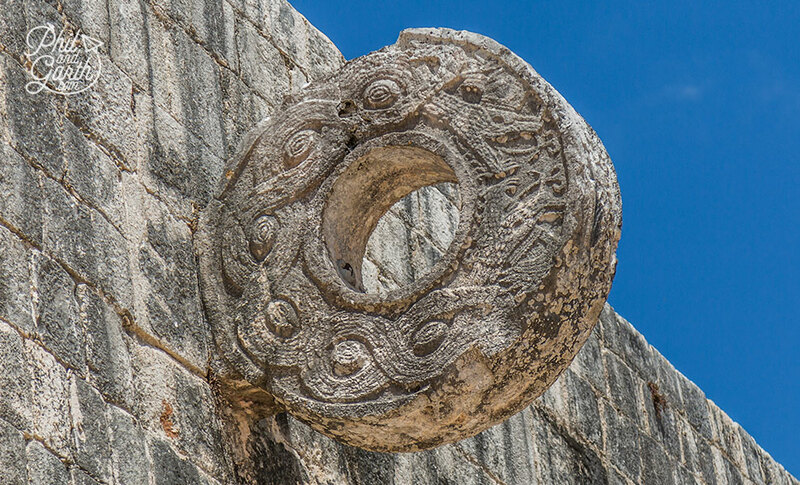 It fascinates me how advanced the Mayan were with their engineering and how they were able to move all of the stone into place with such precision! Your photos look amazing, as usual! 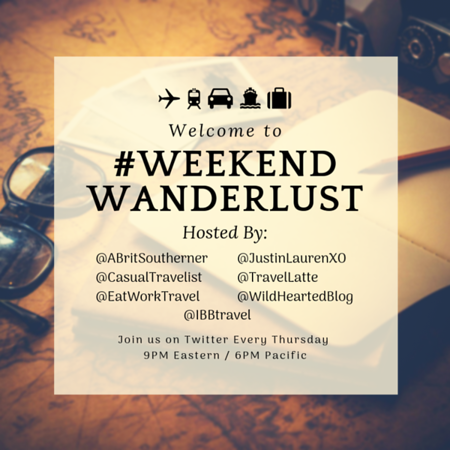 I always want to visit the places you post. 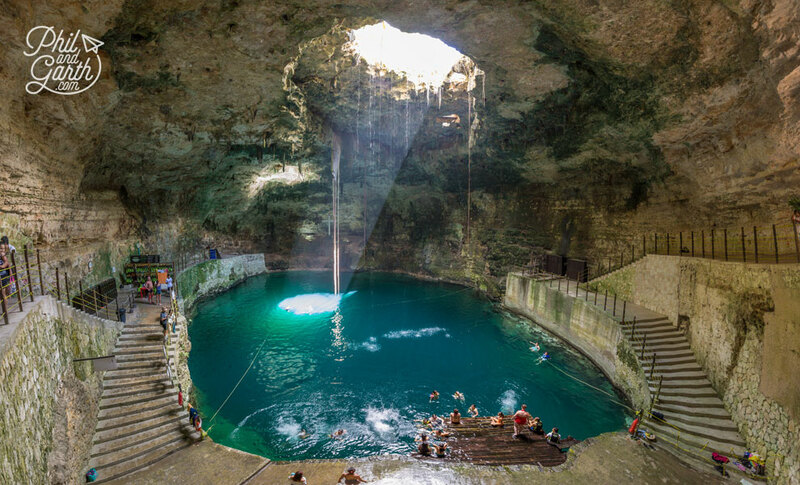 Now, I’m adding this to our must-see places, especially the Cenotes!